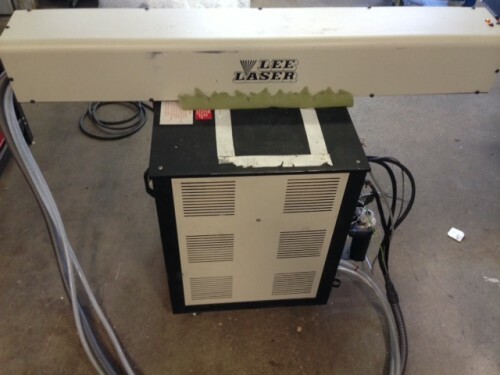 Lee Laser Pulsed Diode-Pumped Nd:YAG Laser System / Model LDPP-50M / Manufactured August 2009 / Rated 50 watts / Less than 750 hours use / Includes beam delivery model N3307-1 Fiber CCTV assembly with B/W CCTV / 220V single phase power required / Tested operational (please see images, power meter is set on the 150 watt range) / More info. & images available / Information Google found: Model LDPP-50M, pulsed diode-pumped Nd:YAG laser is used to precision cut thin metals such as medical stents and stencil masks. Thin metal cutting Lee Laser announces the Model LDPP-50M, a pulsed-diode-pumped Nd:YAG laser that exhibits a pulse decay time that is less than 10 s. The laser is rated at a maximum average power of 50 W. Maximum pulse rate is 1.5 kHz with a pulsewidth range of 30-100 µs. This model will use special, long-life diodes that are expected to yield diode lifetimes in excess of 10,000 h.